Red blood cells: The blood cells that carry oxygen. Red cells contain hemoglobin and it is the hemoglobin which permits them to transport oxygen (and carbon dioxide). Hemoglobin, aside from being a transport molecule, is a pigment. It gives the cells their red color (and their name). The abbreviation for red blood cells is RBCs. 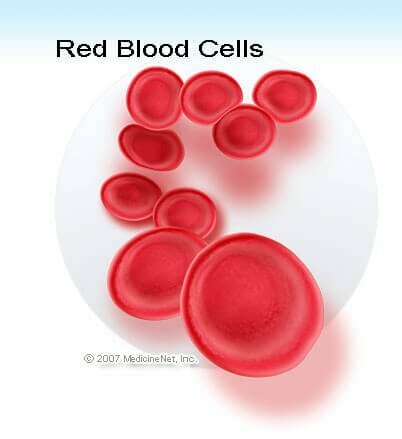 Red blood cells are sometime simply called red cells. They are also called erythrocytes or, rarely today, red blood corpuscles.